Now that I am teaching high school students (as I have been doing for the past 5 years) I often have the opportunity to see how material covered and experienced in the students when they were young reemerges later on. Most of my students have been former Waldorf school students – and of course those who were homeschooled or who went to the public school also show me many things about the results of particular educational methods in their earlier years. As many of you know, one of the hallmarks of Waldorf is the way that topics are experienced first and only gradually brought into full consciousness. At first glance this might seem like the so-called Classical method where the children meet various subjects in a simplified version when they are quite small and then study them again at a later date. But in this method the children are given intellectual content, first on a simple level and then again in a more complex level. In Waldorf, the children meet the material first through their bodies, as is developmentally appropriate at a young age. Then they work with the materials on an artistic level. They thus lay the foundation, so to speak, for later intellectual understanding of the material. This year I have been teaching a group of 9th and 10th graders English. When we worked on Electra by Sophocles, I did not have to spend much time setting the context – they knew, from their 5th-grade Greek mythology and Greek history main lesson what Ancient Greece was like. They “got” most of the literary allusions. They had a feel for the rhythm and meter of the play because of Greek poetry they had worked with; they understood something of the culture. And so their understanding of Electra was very deep and not merely abstract. 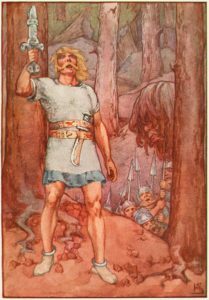 These past few weeks we have been reading Beowulf. I have given them the Seamus Heaney version because I am especially interested in them experiencing the difference between Heaney’s true-to-Old-English translation as compared to more Latinate translations. We were able to jump right in and when we got to the funeral pyre of Shield Sheafson, one of the students looked up and exclaimed, “Oh – just like the death of Baldur!” She had remembered her Norse mythology from 4th grade. And she and her classmates have had no trouble imagining into this poem – they know what Heorot must look like because they know what Valhalla was like. They know about Thor and Odin so they have a feel for the warrior’s code which runs through the story. And because they also studied the stories of the Old Testament in third grade, they have a sense for the tension between the emergent Christianity of the Scandinavian people at the time the poem was composed, and their Viking and pagan heritage. As a teacher, it is deeply satisfying to have students who have such a rich and full background and who can imaginatively and sympathetically enter into complex material. For the students, it is also deeply satisfying as they come to have a feeling of the unity of their education, and of the fact that the world is both knowable and makes sense. New things that they encounter have echoes in past things they have learned. Instead of merely skimming over the surface of material, they have the wonderful experience of penetrating what they learn and seeing connections. Now that is education! Wow, I find this a little breathtaking, and very encouraging! It really reinforces my decision to work with Waldorf! Exactly the education I feel I missed out on and what I hope to give my children!